Infographic published by Prachatai, used with permission. The infographic above, created by the independent news portal Prachatai, offers a snapshot of the current situation in Thailand, where the army has been in power for the last year, after staging a coup. Thailand’s army, led by General Prayut Chan-o-cha, grabbed power in a coup last May, later imposing martial law nationwide. The army also suspended the constitution, detained political leaders, placed strict controls on the media, and banned public protests. The army claimed the coup was necessary to restore stability and end the intense street clashes between various political forces. It vowed to restore civilian rule, but only after implementing certain political and electoral reforms. An interim constitution was approved last August, followed by the appointment of military-backed civilian authorities led by General Prayut, who is now the country’s prime minister. A legislative body was also established, though all its members are all appointed by the military. Since day one of the coup, Thai activists have resisted the military dictatorship. Ordinary citizens have since joined the country's devoted activists in demanding the restoration of elections and other democratic rights. The junta's response has been to detain protesters and subject supposed critics to “attitude-adjustment” treatment. But Thais have resorted to creative means of expressing dissent. Because public gatherings of five or more people are banned, individual protesters have delivered their messages in subtle ways, such as reading George Orwell’s novel 1984 aboard trains, imitating the Hunger Games‘ three-fingered salute, and playing the French national anthem. 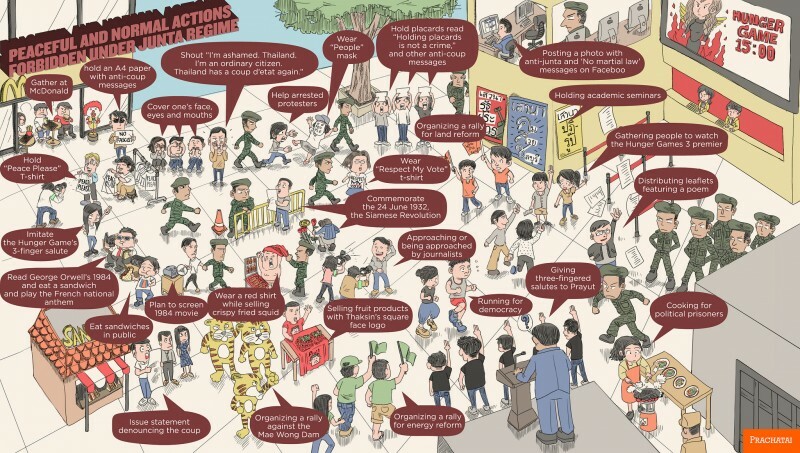 Prachatai‘s infographic lists some of the ordinary activities the authorities have suppressed over the past nine months. People who've “committed” these acts have been arrested for “undermining Thailand's national security.” The junta's paranoia runs deep. Although these anti-junta actions have resulted in intimidation, arrest, detention, and lawsuits from the military, the junta’s draconian measures to suppress people who simply want to exercise their basic rights only drive more people against the regime. half of them associated with red shirt or former government politician. the other half is normal people that protest about national interest and etc.